I do not often feature Kickstarter campaigns on the blog, but when I see a great one, a worthy one, I like to write about it, and see if I can help garner support for it. And boy, do I have a great one today. 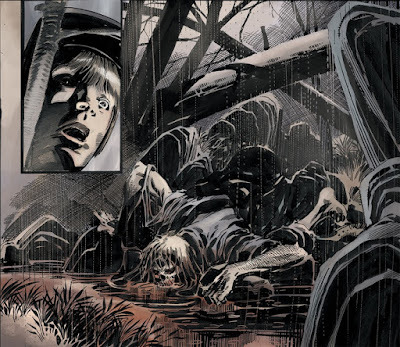 Right now, artist Tom Mandrake -- a talent whose work I adore, on everything from The X-Files/30 Days of Night to To Hell You Ride -- is collaborating with writer John Ostrander on a graphic novel called Kros: Hallowed Ground. This 128-page horror adventure involves a vampire hunter battling the supernatural at the Battle of Gettysburg, and the project has been in the works for ten years. Just look at the art work above, and you get a sense of Mandrake's brilliant style, and also the powerful genre imagery involved. The story premise sounds great (a human battle by day; a supernatural battle by night) too. There's still time to support and fund this project, and I hope you'll consider doing so. Ask JKM a Question: Movie Composers?